Monday the 9th of May brought to a close the final EAAS meeting after a year long train of successful monthly meetings and guest speakers that captivated members with a varied taste of all things astronomical that catered for young, old, experienced and beginning astronomy enthusiasts alike. The final meeting of the series was no different. The main topic entitled ‘Encouraging Youth Into Space’ by Mr Robert Hill who is the educational presenter at the Armagh planetarium and has been working closely with the European Space Agency (ESA) for some time. From the outset, Robert captivated everyone’s attention with his excellent clear cut, interesting verbal summary of his work within ESA and Armagh focussing his ‘field of view’ on getting today’s youth interested in astronomy and science while outlining Armagh’s role in this area. 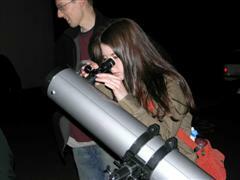 The audience learnt how students and teachers using the internet can access the Faulkes robotic professional research telescope could take real time CCD images of the sky of distant galaxies and nebulae through various filters which provided GCSE and A-level students with an exciting hands on approach to education. Robert used a great array of visuals that showed off various deep sky targets by the Faulkes and a wonderful animation of a beam of light travelling through the Milkyway galaxy towards Earth! His lively talk also featured ESA’s role in Earth observation. At this point we where all treated to stunning satellite images of Belfast, the great Pyramids at Giza, finished off with an incredible view of aeroplane contrails over the entire North American continent! If that was not enough he used our own chairman John McConnell as a visual prop to aid in his astronomical descriptions which kept everyone on the edge of their seats! On behalf of the EAAS I would like to thank Robert for a thoroughly enjoyable presentation and I hope we will be blessed with his presence again in the future. As the meeting ended the sky darkened leaving us with a lovely clear night. 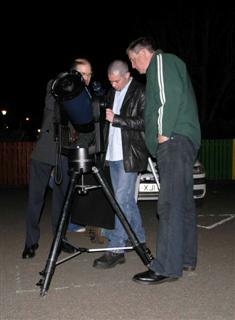 EAAS members had an unexpected observing session in the car park of Ballyrobert primary school . 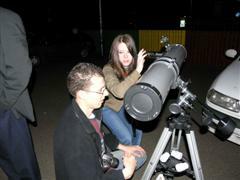 The set up included a Meade LX90 Go-To SCT, 4.5” reflector and 10X50 binoculars. With these instruments we all enjoyed the beautiful 36 hour old crescent moon with earthshine and amazing views of Jupiter and Saturn. With all of us gathered under a canopy of stars I could think of no better way to end the season!